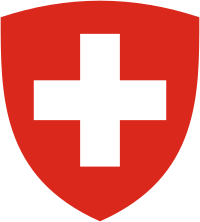 The coat o airms o Swisserland shows the same white Greek cross as the banner o Swisserland, but on a reid shield. The appearance o the coat o airms or shield varies greatly, but the federal resolution o 12 December 1889 on the coat o airms decrees that the fower airms hae equal lenths, in a ratio tae thair width o 7 : 6, an includes a drawin o the coat o airms. Lik the Swiss banner, the coat o airms is uised on mony items such as Swiss francs, Swiss caur nummer plates, an Swiss-brandit exports such as Swiss Airmy knives. Banner o Swisserland - the Swiss banner is a banner o the airms. Wikimedia Commons haes media relatit tae Coats of arms of Switzerland.